This is exactly the kind of dish that I love to make for my family. Flavorful, easy to make, easy clean-up and full of veggies that the kids will love! Seriously, there is nothing easier than a one pan meal. All of this could be prepped ahead of time so that you when you come home from work you simply put the pan in the over and cook for 20-24 minutes and then enjoy a delicious hot meal. That’s actually less time than it takes to cook one a frozen meal. Clean and chop your pineapple and veggies as described above. Top the chicken and vegetables with pineapple chunks, onion slices and green peppers. 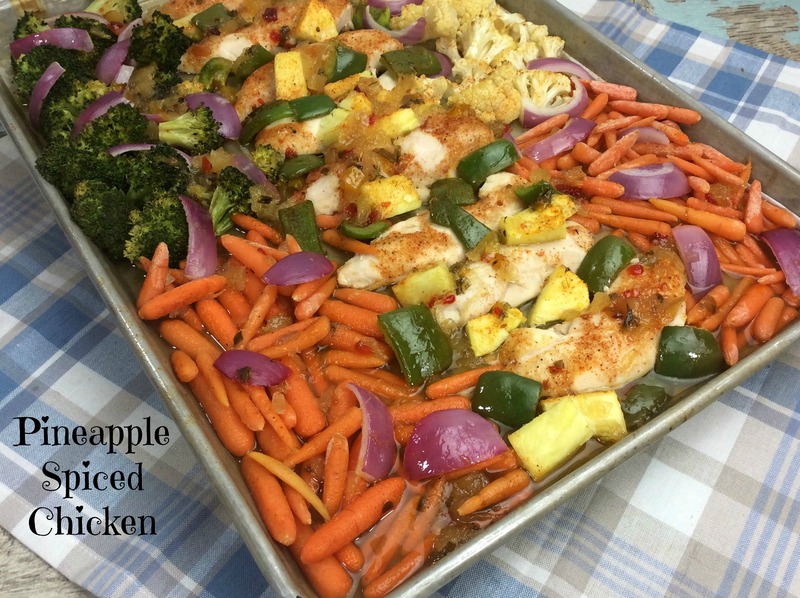 Cook your sheet pan entree for 20-24 minutes or until chicken is cooked through. Get healthy and easy meal plans delivered weekly. Click Here!